I've never had a problem finding adequate taillights for my bicycles, but until recent years most bicycle headlights were dim. A bright one was expensive, and required a large battery for power. A small, battery-powered headlight would alert other road users to my presence and was OK for riding under streetlights, but wouldn't light up a dark road or path. When touring, I’d use generator lights with a headlight mounted low on a fork blade. With dark-adapted eyes, I could putter along without hitting too many potholes. Since 2010, more or less, the efficiency of white light-emitting diodes (LEDs) has increased by leaps and bounds. Generators and rechargeable batteries have improved too. A compact, lightweight bicycle headlight can produce a beam rivaling that from an automotive headlight -- but there is a problem. A common American folly is that More is always Better. The mid-twentieth century had its horsepower race -- every year, cars with bigger and bigger gas-guzzling engines. Bicycling isn't much for horsepower, but it still suffers from the More Is Better syndrome -- in a lighting race. If a headlight is bright enough to light up the road, it is also bright enough to dazzle and blind people at night. A typical bare LED, or one with a conventional mirror housing like a flashlight's, casts a round spot of light. If aimed down at the road, a round beam is unnecessarily bright up close, making it harder to see more distant objects. If aimed high so brightness tapers off closer to the bicycle for even illumination, then the brightest part of the beam glares into the eyes of people ahead and washes out the view of the road in rain, snow or fog. Power is wasted sending light in directions where it is not needed. As LEDs improve, headlights are often promoted with lumen ratings -- total light output, no matter where the light goes -- often, glaring into the eyes of oncoming road and trail users. Certainly, for off-road riding, you want to see the overhanging tree branch which could smack you on the head. But on roads and paths shared with other users, a flat-topped, shaped beam pattern like a car headlight’s avoids blinding people and puts more light on the riding surface. Tapering off the brightness toward the bottom of the pattern illuminates the riding surface evenly, far and near. The USA has no Federal standard requiring a bicycle headlight to have a shaped beam pattern. German standards, on the other hand, have led to production of the world's best bicycle headlights. Several high-performance European bicycle lighting systems with shaped beams, from Schmidt and Busch & Müller, are on sale in the USA. Asian competitors including DoSun, S-Sun and Shutter Precision have also entered the market. Schmidt, Shimano, Shutter Precision and Sturmey-Archer make hub generators which power some of these lights. Others are powered by lightweight, internal rechargeable batteries. Most LED headlights with a shaped beam pattern can be identified by the scoop-shaped internal mirror, curving down from the top rear to the bottom front. The LED is hidden at the top rear. You can also quickly identify the beam pattern by shining the light at a wall. Hub-generator-powered systems are best for touring where you can't charge a battery, but rechargeable battery-powered lights suitable for commuting are more affordable. The photo here is of the Busch and Müller Ixon CoreIQ2 battery-powered headlight, $81 (as of October, 2015) at Harris Cyclery. I'm using a Taiwan-made DoSun battery-powered light: it costs $70 and serves me well. There is a smaller model which costs only about $40. Newer shaped-beam headlights make use of brighter LEDs to provide a broader beam, most useful when there is a turn ahead. Many of the generator lights have a "standlight" function: they store enough power to shine at lower brightness for a few minutes when the bicycle is stopped. Many battery-powered LED headlights offer more than one brightness level. Highest brightness is needed only for fast downhill riding; lower brightness extends battery life under less demanding conditions. A hub generator's alternating current pulses depend on the speed the wheel is turning, and so a light powered by a hub generator will flicker at low riding speeds. This is actually an advantage, because the peak power of each pulse allows the light to shine even though the average power would be too low. This flickering is not the same as the flashing mode with many battery headlights, which will be discussed later. As the price of LEDs comes down, another category of bicycle lights has appeared: small, very cheap lights. Some cost less than a US dollar. They may be found on eBay by searching on "bicycle lights". Skip over the novelty lights which attach to the valve stems of tires: these do not meet legal requirements, and the tires can hide them from view directly ahead and behind. Lights which attach quickly to the bicycle with a rubber strap, like the ones in the picture, do meet legal requirements and are adequate to make bicyclists visible under most conditions. Organizers of large nighttime rides often purchase these lights in large numbers and give them out to ride participants, collecting a refundable deposit in case the lights are not returned. Ride leaders with lights of a different color can identify and find one another. (These should, though, be in addition to the legally-required white headlight and red rear taillight or reflector.) We thank Pam Murray, CyclingSavvy instructor, for this suggestion! Headlights of many cars automatically turn on -- at reduced brightness -- whenever the engine is running; or special lights may turn on. Some studies indicate that such daytime-running lights increase safety; other studies are equivocal; some point out problems such as masking of turn signals. There is a good article in Wikipedia about daytime-running lights, describing scientific work and regulatory issues. Now that bright bicycle lights are available, many bicyclists are using them during daylight hours, and bicycle lights are being heavily marketed for this use. I don't think that any study yet has rated the effectiveness of lights in preventing collisions in daylight, but it is reasonable to expect that they would draw attention to a bicyclist. The small size of a typical bicycle headlamp -- a point source at usual viewing distances -- may reduce its effectiveness. The Wikipedia article indicates that this effect has been demonstrated in a comparison of motorcycle headlamps at low beam vs. specialized, smaller daytime-running lamps. Many bicyclists who use lights during daylight hours do not ride at night. These are mostly recreational road riders or racers on training rides. Bright bicycle headlights used during daytime do not blind people. Sunlight, even behind clouds, is bright enough that glare from bicycle lights isn't a problem. A light which is bright enough at eye level to draw attention in full daylight can also blind people at night, a problem when lights are designed, promoted and purchased based on their performance in daylight. Ideally, a bicycle headlight would have different settings for daytime and nighttime, as with motor vehicle lights. But without any design standard in place, the brighter-is-better concept dominates in the market. Daytime running lights raise the bar for passive crash prevention previously limited to advice to wear bright-colored clothing, and perhaps also create pressure for laws requiring all bicyclists to use them. All too typically, promotion of lights for daytime use neglects to mention active measures such as positioning to be visible (also making the light visible), control and release of the travel lane, hand signals and use of a rear-view mirror. If a headlamp with a shaped beam pattern is aimed higher during the day and lower at night, then it can serve well under both conditions. Adjusting aim is easier with some headlights than with others. My handlebar-mounted DoSun is may even be too easy to adjust: it sometimes goes out of adjustment due to road vibration or if I bump it with my hand. No flashing at night, please! Many battery-powered headlights flash. Flashing increases battery life because the light is only on for a fraction of each second. Flashing may help by drawing more attention during daytime. But -- a flashing headlight works poorly to light a bicyclist's way at night, is hard to track with the eyes, and can trigger seizure disorders in people who are prone to them. Bicycling east on the [bicycle path on the] I-90 bridge in the dark, watching two faster riders who'd just passed me, pulling away from me up the bridge. A westbound rider comes around the corner with the most dazzling flashing headlight I've ever seen. Ahead of me, the lead rider, blinded by the glare, slows down. The second rider doesn't see the first rider has slowed down, and veers left to avoid a collision. As the westbound rider squeezes through, he screams "@$$#01&!" at the second rider who had veered into his path. I stop and protect my vision with my helmet visor as the westbound rider continues blindingly down the bridge. Bicycles, unlike other vehicles in Washington, aren't required to aim their headlights low enough to avoid glare-blinding oncoming traffic. That was fine when bicycle headlights were dim yellow incandescents, but today's bicycle headlights can be brighter than car headlights. It's time for the Legislature to update bicycle headlight requirements for today's technology. If you blind an oncoming rider so badly that he ends up veering into your path, he's not the @$$#01&! Flashing headlights are illegal in most of the USA, too, not only in Washington. For this reason, a person who causes a crash by blinding someone with a flashing headlight risks being held at fault in an insurance claim. Correct headlight installation is important to take advantage of shaped-beam headlights. They are made to be mounted at fork-crown or handlebar height. A high-mounted headlight is more likely to glare; a headlight mounted lower, on a fork blade, reveals potholes better but illuminates a smaller area closer to the bicycle; also, the wheel casts a shadow in the headlight's beam. A pair of headlights mounted either side near the top of the front wheel can avoid this problem, but this is a custom installation. A battery-powered headlight may be supplied only with a handlebar fitting, and can be obstructed by the brake levers, hands, a rain cape or handlebar bag. Brackets are available to hold a handlebar-mount headlight lower. Aiming the headlight is easy: the flat top of the beam pattern should go a bit below the horizontal to achieve even illumination of the riding surface. An LED headlight contains electronics which may cause radio interference, preventing a wireless cyclecomputer or GPS unit from recording when the headlight is on. Moving the headlight farther away may solve the problem. If you're into do-it-yourself work, I've found that LED lights made to use with a generator will also work from the direct current of a 6-volt battery. That is convenient if you don't have the generator, or must use the light on a second bicycle. An external USB battery pack may also be used to supplement the internal battery. Never connect an alternating-current (generator) power source directly to a battery or battery-powered light, unless you would like to destroy one, the other or both. Adapters are available though to convert a generator's alternating current to direct current to power a cell phone or charge a battery -- useful for evening lighting for a bicycle tourist. We describe such a setup on our page about GPS with a smartphone. Many battery-powered LED headlights can be charged by a generator with an adapter, and also have an output socket where a USB (universal serial bus) cable can be connected to power other devices. A high beam/low beam dip switch (not only a brightness switch) . 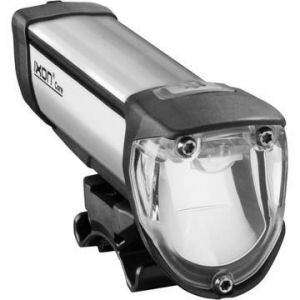 This would mainly be useful for off-road/on-road rides and daylight running: bicyclists rarely go so fast as to need a headlight beam which extends farther ahead than a car low beam. Keeping the beam level and pointing it in the direction you are going when you are leaning in a turn. This would require a sensor, computer processing, and motorized adjustments or different LEDs for different angles of lean. But this would be no more complicated than the electronics already showing up on bicycles!